Transitions during the formative teenage years can be hell to get through. Changing bodies, raging hormones, a desire for acceptance, and seemingly unsympathetic power structures make for a volatile, anxiety-inducing mixture. The instability and alienation also provide fertile grounds for thematic exploration that marries coming-of-age distress with the horror genre. 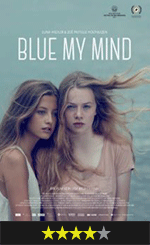 Blue My Mind, the striking debut feature from Swiss writer/director Lisa Brühlmann, does this with great effect. To varying degrees, it tackles material covered in films like Carrie, Ginger Snaps, and last year’s Raw, but stands out thanks to a deliberate pace, arresting cinematography, and Brühlmann’s keen vision that blends the real and relatable with the fantastic.